It is a rare opportunity to be able to better understand the origin of one of nature’s most diverse groups of vertebrates. Lizards and snakes (squamates) comprehend more than 10,000 living species and over hundreds of known extinct species, being a fundamental component of ecosystems worldwide both today and in the distant past. During their long evolutionary history, lizards became adapted to gliding, swimming, enduring deserts, living high in forest canopies, climbing surfaces as smooth as glass and even running over water. Despite our increasing knowledge on the modern diversity and ecology of lizards and snakes, almost nothing was known about the origin and earliest stages of their evolution. In a paper just published today by myself and colleagues, we shed light on fundamental aspects on the origin and earliest stages of the evolution of squamates. In our study, we provide a new phylogenetic data set and analysis, along with several new anatomical details on a previously enigmatic fossil reptile called Megachirella wachtleri (first described by Renesto and Posenato in 2003). Found almost 20 years ago on Monte Prà della Vacca on the Dolomites in the Italian Alps, this represented a well-preserved specimen that we expected to hold fundamental answers to understand the early evolution of lizards. Me and my colleagues here in Canada, Italy, Poland, Australia and USA worked on conducting a high-resolution CT scanning of the only known specimen of this taxon. We were able to identify, for the first time, features indicating that this particular species is the oldest known fossil lizard in the world by 75 million years, pushing back the fossil record of lizards to 240 million years ago. Several different aspects about this finding, and in the history behind Megachirella have now been reported in several media outlets. 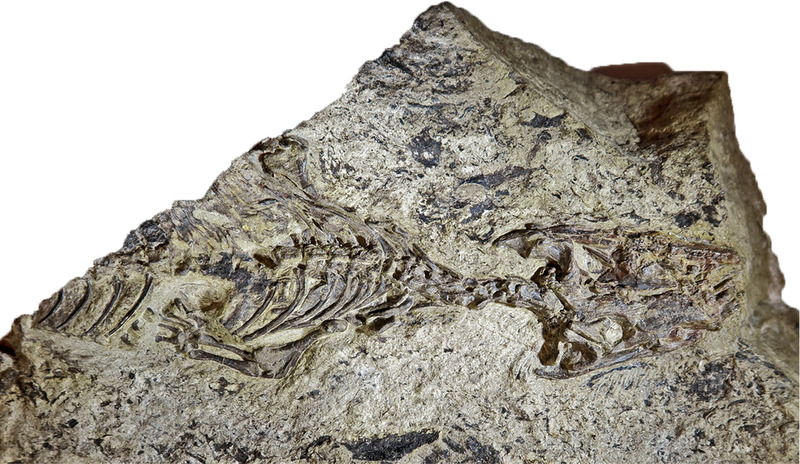 Therefore, I would like to focus here on some important aspects of our study that make it somewhat distinct from most other studies on fossil reptiles, and which do not always reach the news. One aspect that may escape the attention of readers was the scale of this particular study. Me and all of my dedicated co-authors spent hundreds of hours on CT scan data processing, anatomical description and discussions over the implications of our findings between 2015 and 2017. But beyond that, collecting anatomical data to encompass all major lineages of early reptiles and lizards for our phylogenetic analyses (to understand the relationships and the time of origin of those lineages) was my personal Everest. Differently from molecular data, morphological data collection for phylogenetic analyses is usually a much slower and time-consuming process. Even more when collecting data from fossil species, because not only they tend to be poorly preserved compared to skeletal specimens of modern species, but also because there are usually few specimens available for most fossil vertebrates. To make things even more complicated, those fossils are housed in museum collections widespread across the globe. This forces most researchers using data from fossils to obtain anatomical information mostly from the literature, which can be limiting given that not all anatomical components may be illustrated or correctly described. However, personal data collection of anatomical data allows a more accurate and efficient data collection for the purposes of phylogenetic analysis. With this in mind, between October 2012 and early 2017, I visited 51 museum and university collections across 17 countries over an accumulated period of time of nearly 400 days to collect this valuable anatomical information on hundreds of specimens, representing 129 species of living and fossil reptiles. The challenge was big, but me and my PhD supervisor (Michael Caldwell) knew the benefits could outweigh the costs. 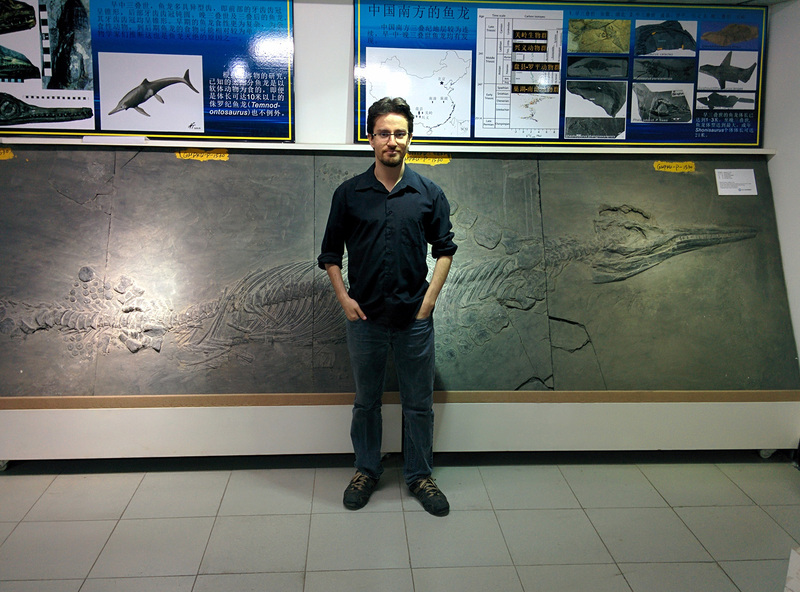 Me studying the fossil reptiles collection at the Field Museum of Natural History, Chicago (top) and at Peking University, Beijing (bottom). 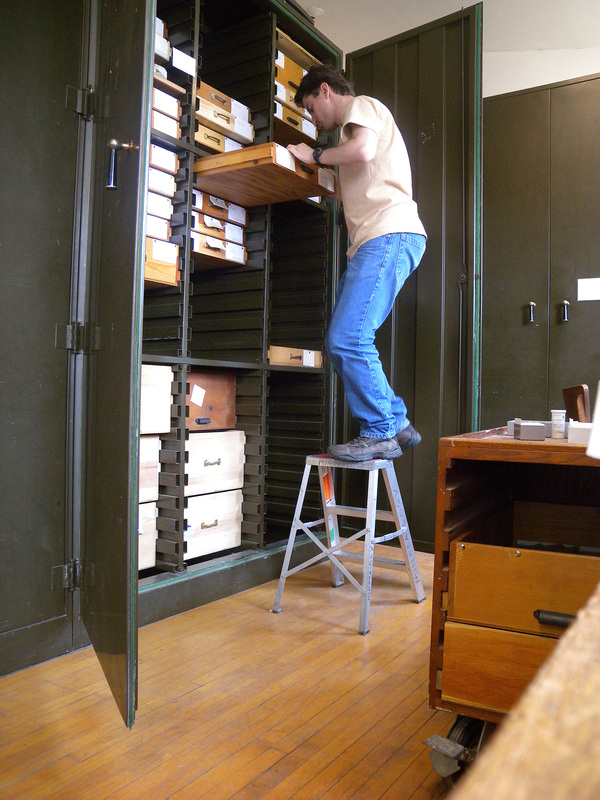 The hard work paid off and I managed to amalgamate a gigantic library of information on fossil and living reptiles. Along with revisions on characters utilized on reptile phylogenetic data sets, this new information that I collected allowed us to provide a new look into the reptile tree of life (which also became the core of my PhD thesis). Combined with the new anatomical information from Megachirella, the results provide the first ever agreement between previously competing hypothesis regarding the early evolution of squamates. Until now, morphological data had always indicated that iguanians (such as chameleons and iguanas) were the earliest modern lineage of lizards to evolve, whereas molecular evidence consistently supported that geckos and dibamids (a small family of limbless lizards) were the earliest evolving squamates. Our results (even in analysis using only morphological data) all indicate that geckos lie among the earliest lizards to evolve among the modern families and that iguanians are more deeply nested inside the lizard tree of life. This is the first time that morphological data agrees with the molecular data. Although reasonable arguments had previously been used to defend both hypotheses, agreement between very different types of data is always a good sign that we are moving on the right direction. Finally, our estimates on the time of origin of the major groups of reptiles indicate a much older origin of those lineages than previously imagined: before the Permian-Triassic Mass extinction at 252 million years ago. This much deeper evolutionary history of squamates opens new research opportunities and questions that need to be addressed before we can have a more complete understanding of the earliest stages of squamate evolution. We still know almost nothing regarding the evolution of lizards between the Middle Triassic (the time of Megachirella) and the Late Jurassic, a time span of 85 million years. This is more time than that between the first humans and the last non-avian dinosaurs that corresponds to an extremely fragmentary record of squamate evolution. How many different squamate body plans, lifestyles and extinct lineages remain to be discovered? So far, the evidence indicates we only have the tip of the iceberg figured out and that additional research and new fossil evidence will be fundamentally important so we have a grasp of the many complexities that may surround early evolution of lizards and snakes. PS: Despite this personal account, I could not finish without emphasizing the fundamental role of all of my co-authors in this study. It is also important to remember here that the locality where Megachirella was found is an important UNESCO heritage site and an extremely important natural heritage of Italy (https://whc.unesco.org/en/list/1237). Finally, I really need to provide my special thanks to Evelyn Kustatscher (Naturmuseum Südtirol) and all other museum creators that made this study possible!